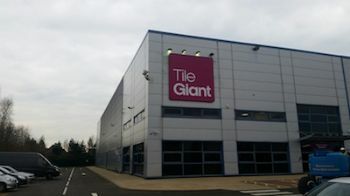 Tile Giant has selected Lichfield as the location for its first standalone warehouse. The new 100,000 sq. ft site will be fully operational by April and will increase Tile Giant's capacity as it serves the company's 110 stores nationwide. Employing over 40 colleagues the move is part of Tile Giant's plans for expansion in 2016, which will also see the addition of more stores to its already large network. Tile Giant managing director Andy Morrison said: "The new site, at more than 100,000 sq. ft, will increase capacity by 40 per cent, helping to ensure that we are able to deliver excellence across all areas of the business, maintaining first-rate customer service and inspiring customers across the UK with the latest in tile design and interior trends. "The additional space will ensure we retain strong links with the rest of the Travis Perkins group whilst allowing us to provide customers access to the widest range of tiling products, delivering exciting new ranges on the shortest possible lead times and improving the tile buying experience for everyone."